The Best Iron Sights for AR 15: What are Your Options? Despite the popularity of optics as the primary targeting mechanism, shooters will also try to find the best iron sights for their rifles. That’s because these sights are very durable and of course will never run out of power. Besides, they are an excellent choice when you are looking for a backup sight. Electronic sights are great but… what if your favourite sight fails when you really need it? → What is it made of? If durability is your priority, then steel sights would be your best option although they can be very heavy. If you really wish to keep it light, then you’ll probably gravitate towards the polymer sights at the expense of its comparative fragility. And if you can’t really decide between the two extremes, you can compromise by choosing aluminum. If you notice, it’s all about choosing what’s important for you. Getting the best of something means you have to make sacrifices in another area. This is a general trend when you’re trying to pick iron sights for your AR 15. → Do you want fixed sights or folding sights? Each choice here has its good news and bad news. With the fixed sights, you have to put up with its presence affecting your field of view, which can get annoying when you’re using your primary targeting mechanism. But at least it’s always on a ready position. With the folding system, you have to take the time to set it up when you need to use it, but at least you can put it down when you’re not using it. → Selecting the height of the sights. Your options here are gas block height, same plane and micro. The rule with iron sights is that the front and the rear sights ought to sit at the same height. If not, being on target can be a problem. You can use micro sights when you have to get smaller sights. When your rails sit at the same height, you’ll need same plane sights. You’ll also need a gas block height front sight if you’re going to mount the front sight on a gas block. The weapon configuration will dictate your choices here. → Choosing the peephole style. Now this is another feature that depends on your own preferences. (Some people prefer to call it aperture.) The standard peephole is round, and it comes in two different sizes. There are also diamond-shaped peepholes, which some say are better than the round peepholes. What do you prefer? → Visibility. Now this is a feature that can be assessed much more objectively. Some iron sights are simply better when it comes to offering a sight picture so that your eye can zero in on the target. Then, there are tritium sights which are regarded as the best for low visibility. They use illumination with the need for batteries to make the contrast. You can also use high-visibility sights that create a high contrast image, which lets your eye focus faster. To cut a long story short, there’s really no such thing as the absolute best. It depends on your preferences and on what you’re used to. When you get the iron sights you really like, and it jives with how you trained, that’s when you know you made the right decision. Just make sure you get them as a backup for your primary target mechanism. Remember the rule that all soldiers know by heart: it’s better to have them and not use them, than to need them and not have them. For true blue shooters, learning how to aim with iron sights is a necessary skill to learn. Red dot sights may be well and good, but sometimes they go up at the most inconvenient times. By learning how to use iron sights, shooters don’t have to spray their bullets all over the place. The problem with these backup sights is that sometimes they can cost a lot of money. Buying cheap, on the other hand, may result in a low quality product. But with the MAGPUL Gen 2 Front Back Up Sight MBUS, you can actually pay a small price and get huge benefits. One of the reasons for the low price is that it is made of polymer, albeit it is impact resistant. Flipping up the sight is easy enough by pressing the top or activating from the side. The spring tension also locks it down, but with enough give upon impact. The protective wings offer additional protection. The MAGPUL Gen 2 Front Back Up Sight MBUS is compatible with most MIL-STD-1913 Picatinny/STANAG 4694 railed hand guards. It also offers same height-over-bore as standard A2 irons. 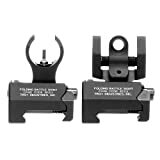 The elevation adjustment tool is part of the purchase normally, but shooters can use just about any aftermarket A2 front sight adjustment tool. The MAGPUL Gen 2 Front Back Up Sight MBUS comes with a very reasonable—in fact, a very affordable—price tag, yet somehow it also comes in a very high quality. The polymer may not be technically “iron”, but it’s virtually as tough and it’s lighter as well. It will last for quite a while. This sight is very easy to mount, and zeroing it doesn’t take a lot of time and effort. The spring tension is great too. Snapping up the sight is quick and firm, but it offers enough give when it hits something. The accuracy is also undeniable, and it offers quite a relief if a shooter’s red dot battery dies at an inopportune time. But of course it’s not absolutely perfect. For one, it can’t be mounted to a railed gas block because of the heat. It also has to be mounted to a railed fore end that’s on the same plane as the receiver rail. For this reason, this Magpul front sight won’t work with MOE hand guards. The MAGPUL Gen 2 Front Back Up Sight MBUS is a piece of compelling evidence that superior quality doesn’t have to be expensive at all. Shooting accurately is always a big deal. That’s the point of owning and using firearms. Either you mess up in a shooting range and embarrass yourself or you screw up big time in an actual firefight and you end up in a box. Either way, you need high quality when it comes to firearms accessories and parts, and for the most part you need to spend a significant amount of money. But in general, they’re often a better investment than cheap products. The Troy Industries Micro HK Style Front and Rear Folding Battle Sight demonstrates this fact beyond a doubt. Shooters with raised top rail systems will find the Troy Micro BattleSight much to their liking, and the same goes for those who simply prefer a sightline that’s close to the barrel. They’re only sold as a set, but they come with a lifetime warranty. They stand about 1⅜” high and about a half inch high when folded. They also come with the standard wind and elevation adjustments. Since it’s sold as a set, you don’t have to worry anymore about find the right front and rear sight combination that works. With these sights, you already know they work. What’s more, they work really well. Troy didn’t build their sterling reputation on shoddy products. The build quality is obvious upon sight. There’s no plastic to be found at all. The picatinny mounting is very solid, as is the locking system. There’s no wiggle. They’re just about perfect as can be. As for the disadvantages, the price maybe the most notable sticking point. It may not fit the budget of some shooters. Still, it may be a better investment in the long run to save up for these sights. Also, you may want to consider buying a Troy sight adjustment tool made precisely for these sights so you don’t scratch them when making adjustments and that’s another expense. While you can always get yourself a cheaper set of sights, such a decision doesn’t really make much sense. Cheaper sights don’t work all that well, comparatively speaking, and they also don’t last. But with the Troy Industries Micro HK Style Front and Rear Folding Battle Sight, you know that you’ll be able to put your bullets where you want to, every time. When it comes to shooting, perhaps one of the most important factors to consider is accuracy. It’s a matter of pride for most shooters to shoot straight and to put a bullet right where they want to. For that, rear sights can be invaluable. And although some sights can cost a pretty penny, others are downright cheap. The UTG Model 4/16 Complete Match-grade Rear Sight falls firmly into the cheap category, but that doesn’t mean that they’re to be avoided. In fact, for a lot of shooters this rear sight can be all they need. The UTG Model 4/16 Complete Match-grade Rear Sight is made from aluminum and steel, and it comes in a matte-black finish. It’s about 1.41 inches high, and it can be adjusted for elevation and wind. It features A2 style dual apertures to enable close range and long range aiming. It also comes with a one-piece integral Picatinny mounting deck. Obviously, the price has to be mentioned first. In general you may save more than a hundred bucks when you get this UTG rear sight instead of buying from a “name” brand. But there’s more to these sights than just the affordability. The construction is also considered very durable by just about everyone. For the most part, this rear sight is very easy to mount, and once it’s in place it tends to stay in place. When you use it, the dual apertures prove to be quite useful both for long range and for close quarters. It’s also very easy to adjust. For some shooters, there may be a problem in finding the right front sights to work well with this rear sight. Users should also keep in mind that it is not collapsible, so that must be taken into consideration when getting a long scope. Like most “affordable” sights, standardized quality control may not be uniform across the board. You may be among the lucky ones who get the perfectly fine units, but you may also be the unlucky shooter who gets a shoddier sample. Chances are, though, that you’ll get the better ones. But all in all, the price makes it a satisfactory gamble. If you get a good model then you save hundreds of dollars, and if you get a bad one you just need to get it replaced or you’re out a few measly bucks. While it’s easy to find a top of the line back up iron sights that cost a lot of money, it’s not always that easy to justify such an expense. That’s especially true when all the shooting you do is at the range and your primary sights are very dependable. Another reason for hesitating to buy expensive back up iron sights is that often you can find sights that don’t cost nearly as much yet they perform decently. Such is the case with the Flip Up Front and Rear Back up Iron Sight from Field Sport. These sights emulate the style of the Mangonel front and rear flip up sights. They are made from 6061 aircraft aluminum with a level 3 hard anodized finish. The aluminum body is also heat treated. These sights come with a flip and down feature, and that enables the use of optics. The front sight A2 post can be adjusted for elevation and it comes in two different height levels. The rear sight can also be adjusted for the wind. 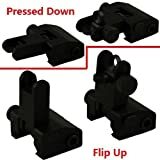 Aside from the low price, there are lots of good things to be said about the Flip Up Front and Rear Back up Iron Sight. In general, these sights are firm and they lock down in place. Sometimes, though, a bit of an adjustment may have to be made. Popping up the sight is easy, and they can hold zero very well. But with that price, you may have to expect some disparity about the quality. In other words, it may be a crap shoot when it comes to what you would be actually receiving. Some units may work flawlessly, while a few others may not. Some reports have surfaced about either the front or the rear sight being wobbly, for example, although not to such a degree as to make the sight worthless. Another “problem” is that these sights aren’t going to win any beauty contests. With that kind of price, the focus was obviously (and quite rightly) on the functionality and not on the aesthetics. For backup sights, the Flip Up Front and Rear Back up Iron Sight isn’t too bad. That’s especially true when you consider just how cheap it is. These sights function as well as they ought to for the most part, and in the end that’s what really matters. In battles—whether in a competition or an actual gunfight—high quality backup iron sights may spell the difference between winning and losing. That’s why many shooters don’t mind paying top dollar for high quality parts for their firearms. The consequences of losing may simply be too horrible. 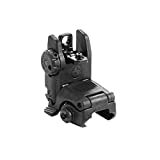 But as the GDT AR15 AR 15 Front and Rear 45 Degree Rapid Transition BUIS Backup Iron Sight demonstrates, it’s not necessary to shell out a lot of money for quality sights at all. These sights are durable 7075 aluminum, Mil-Spec hard anodized. They offer adjustments for wind and minute of angle elevation. These are low profile sights that extend just a fifth of an inch above the top rail, so there’s no interference with the primary optics. They are securely mounted to Picatinny rails, offset from the center by 45 degrees. That means there’s no more need to make manual adjustments, and the field of vision is clear and uncluttered. The first thing anyone will notice about these sights is the price: it really quite cheap. Yet despite the low price, nothing about the way it functions is cheap at all. The material is very durable. The sights enable a shooter to transition quickly from a long range target to a close range target without missing a beat. The mounting is very firm, and it remains that away even after many hundreds of rounds. As for the cons, there’s just one thing that may cause some shooters to hesitate pulling the trigger on these sights. That’s because it’s made in China, and that may set some people to immediately assume it’s not that good at all. When it comes to cheap products, most people expect to get cheap quality in return. But that’s not really the case with the Rapid Transition Sights. For the price, it’s very good. It’s so good because the design seems to match those that are priced up to ten times higher. 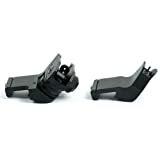 Some experts are saying there may be some legal issues about patent infringement in the future, so for those who are interested it may better to purchase the GDT AR15 AR 15 Front and Rear 45 Degree Rapid Transition BUIS Backup Iron Sight now rather than later. It’s literally got the most bang for the buck value.